When writing a script in bash you can pass parameters into that script to work with. For example, let’s say I have a script file called runme.sh and I want to pass in my name and today’s date. I could do that like this. Inside the script I can get access to the parameters by using the bash param variables of $1, $2, and so on. With a little bash code written up like this. ‘bash’ A.K.A. The Solution for Everything – A few of the *Special Files*! In bash, the shell reads one or more startup files. Here’s the details about what’s what and which is run when. /etc/profile is executed automatically at login. The file from the list of ~/.bash_profile, ~/.bash_login, or ~/.profile are then executed at login. ~/.bashrc is executed by every non-login shell, but if sh is used to invoke bash it reads the $ENV for POSIX compatability. For reference, the ~ symbol is used in place of the user directory. One way to check this out yourself is to change directory to ~ with a cd ~ in the shell, then type pwd which will give the current directory. You’ll find that it is something like /Users/adron where instead of my name it’d be your user name. When invoking the shell, you can also skip the ~/.bashrc or otherwise change the way bash starts up with the following options. bash --init-file theFileToUseInstead or --rcfile instead of ~/.bashrc. bash --norc which is similar to invoking with sh, which will use $ENV. bash --noprofile will prevent /etc/profile or any other personal startup files. This will provide a pretty baseline bash shell for use. Until next time, happy bash code thrashing! The Nuances of Go – This is going to be a series where I go through some of the details of Go. It’s going to be kind of all over the board, but drill into usage of the language, the why, and what for of various features, capabilities, and related topics. ‘bash’ A.K.A. The Solution for Everything – Bash has been around for a while. But let’s not talk about how old it is, the shell has been used and is being used by about every single operating system on the planet. It’s hugely popular and it isn’t exactly being replaced. You can also basically do anything on a computer that you would want to or need to do with it. However there are lot’s of features and commands one ought to know, this series is going to tackle a new command every new post and go into details of how to use it, what it can be used for, and related tips n’ tricks. Distributed Database Things to Know – This series is going to cover various features and nuances of the Cassandra distributed database cluster technology. I’ll be diving into a whole host of capabilities, code, and a pointer or three back to white papers when relevant that helped bring these distributed databases into existence. My goal with each of these is to rise early Monday morning, and time box each article to about 30 minutes. 30 minutes for Go, 30 minutes for bash, and 30 for Cassandra. Then I’ll publish those throughout the week. I set this goal with the hilarious fact that I’m taking time to go record some LinkedIn learning courses on Go and Terraform. With that it might be a week before you see the next trio published. But they’re halfway written already so I might surprise myself. Happy thrashing code! This entry was posted in Just News and tagged bash, cassandra, go, golang, series on October 10, 2018 by Adron. I’m sitting here trying to get the folder structure for my project into a kind of ASCII Tree or something. I wasn’t going to manually do this, it would be insane. Especially on any decent size Enterprise Project with an endless supply of folders and nested content. I went digging to come up with a better solution. On Linux I immediately found the Tree Utility which was perfect. Except I was on OS-X. First option I gave a go to was to build the thing. Because I like to do things the hard way sometimes. First I needed to get the source, which is available here. Once downloaded, unzip the source into a directory and find the following section for the particular operating system you want to use the utility on. The section for OS settings looked like this when I finished editing it. Now get a good build of the command file. Now let’s get tree into the executable path. Make sure your ~/.bash_profile is setup right, include this. Reload the shell and tree should be available as a command. The other option which is really simple, if you don’t want to compile to code, is to just use brew to install it. So now you can use tree, and do cool stuff like pipe it out to a file. If you’re running this against a Node.js Project you may want to delete the node_modules directory and then just reinstall it after running the tree command. Then in your README.md file you can include the folder structure in the description of the project. Here’s a sample output! That’s a super easy way to offer better documentation that provides some real insight into what various parts of the project structure are actually for. This entry was posted in How-to, Software Projects and tagged bash, command line, folder structure, project organization, project structure, tree on May 6, 2015 by Adron. I’ve downloaded and installed MySQL recently. I was doing a few things to make it easier to work with and thought, “I ought to document this, it isn’t real intuitive without pages of documentation being read.” So here’s some tips. set dotVisible to do shell script "defaults read com.apple.Finder AppleShowAllFiles"
do shell script "defaults write com.apple.Finder AppleShowAllFiles 1"
do shell script "defaults write com.apple.Finder AppleShowAllFiles 0"
Then save the file with the following options in the save as dialog selected. The only thing you really need to set is the File Format to “Application” and be sure nothing is checked. Now whenever you double click the file on the desktop, the finder will automatically be restarted with all the files visible, and double clicking again will hide all of the files from view. That’s it for now, more tidbits to come and a write up of my extended weekend PDX hacking sessions with Geoloqi. 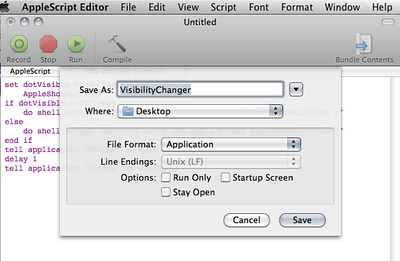 This entry was posted in A Bite o' Apple, How-to and tagged alias, apple, applescript, bash, file visibility, mysql on September 12, 2011 by Adron. …I had not setup bash shell as my shell on this Mac?! Oops. So since I’m a virtual noob sometimes, and I have no idea how to setup bash, I did some searching and came up with this solution. Then add this to the bash file. Now run the install (usually you’re told to setup this bash file afterwards, but figured we might as well get it done). Next exit (or whatever your restart of bash technique is) and open your bash terminal back up. Type this command to be sure we’re on the right path. Now to install the latest Ruby on Rails bits you can issue a command like this. Once those are installed you’ll want to set one as default. I’m went with 1.9.2 for now. This can be changed later if need be. Happy coding, hacking, and gem installing! Some references are included above as links, but these below didn’t fit exactly in context at any point, I however used them none the less. This entry was posted in How-to, Ruby on Rails Bits and tagged bash, bash console, console, rails, ruby, ruby on rails, ruby version manager, rvm, terminal on September 5, 2011 by Adron.